BIG NEWS! Macabre Fantasy will be returning to the Lovecraft Film Festival at the historic Warner Grand Theater in San Pedro! This year the festival is taking place May 1st-3rd. We will be performing the evening of Friday May 1st. We are doing a DOUBLE FEATURE of M.R. James’ “Count Magnus” and Edward Bulwer-Lytton’s “The Haunted and the Haunters: or The House and the Brain”. You can purchase tickets right now through the kickstarter and of course tickets will be available on the day at the theater. Also, for those of you not in the Los Angeles area (or unable to attend in person) you can purchase a “There in Spirit” pass through the kickstarter and stream content from the festival including our performance for only $20! Comikaze DOUBLE FEATURE – H.G. Wells & H.P. Lovecraft!!! 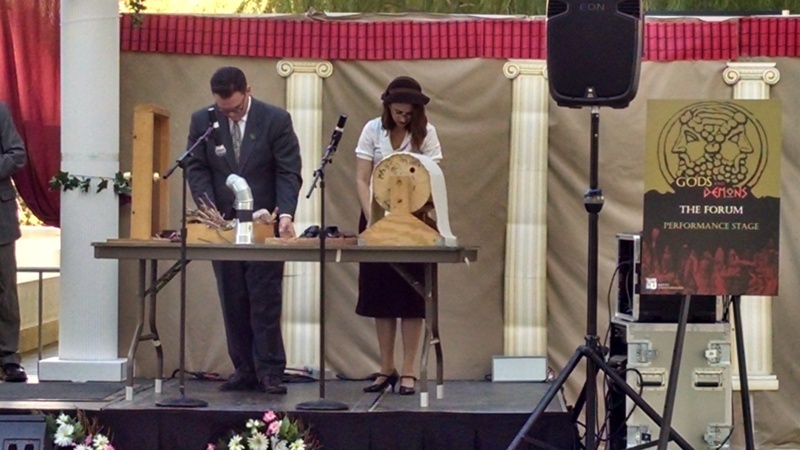 Macabre Fantasy performed at the Getty Museum! 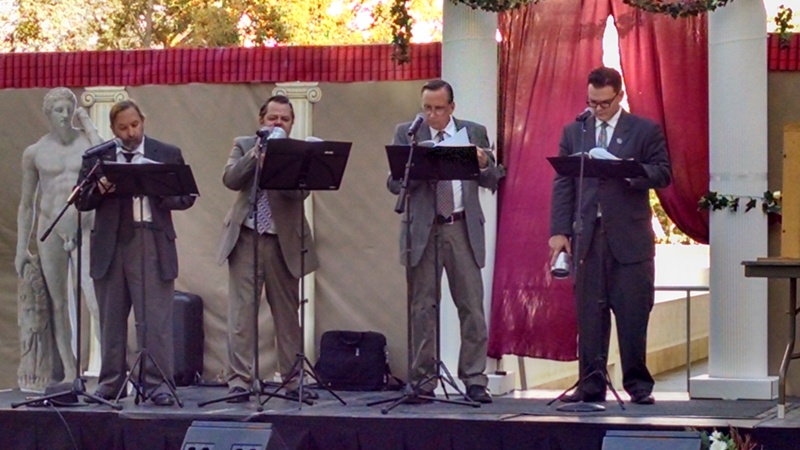 We recently had the honor of performing one of our episodes at the Getty Center museum in Los Angeles, CA. I updated the artwork and the tagging of the first episode, The Statement of Randolph Carter, to match that of the second episode, The Temple. So, now they should organize correctly in whatever media player you happen to use. This weekend is the forth annual H.P. Lovecraft Film Festival-LA (Sept 27-29) taking place at the historic (and beautifully Art Deco) Warner Grand Theatre in downtown San Pedro, CA. 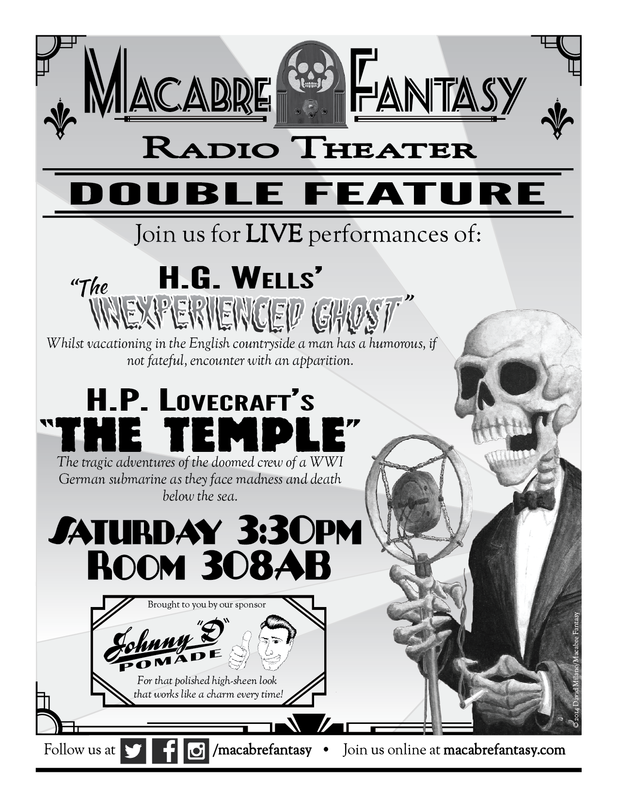 I am very excited that Macabre Fantasy Radio Theater has been asked back to the festival. This Friday night we will be performing another classic weird tale in the style of “Old Time Radio”, and one of my favorite of Lovecraft’s works, The Temple. Set during WWI our story follows the tragic adventures of the doomed crew of a German submarine as they face madness and death below the sea. Then, Saturday afternoon, is the World Premiere of a short film that I directed (my first) called Total Party Kill. It tells the tale of a group of friends playing a table-top RPG as the world of the game crosses into the reality of the players. Watch the trailer! If you are able and so inclined please Buy Tickets and join us this weekend! Also, if you can’t attend in person you can purchase a “There In Spirit” pass that will give you access to the LiveStream (watch our “radio” show!) as well as the Short Films! We’ve got some exciting news about some current projects. Next month we will be returning to the H.P. Lovecraft Film Festival-LA (Sept. 27-28) performing another original adaptation of a classic weird tale in the style of “old radio”. The festival is selling tickets through their Kickstarter as well as “There in Spirit” passes that allow purchasers to view content from the festival (like our performance) remotely. Hopefully some of you will be able to join us either in the theater or from the comfort of your homes for some classic audio drama chills & thrills!